Do you suffer from numbness and tingling in your feet or feel like you’re walking on a pebble? The you could have a Morton’s Neuroma! This is an important article that could get you back on your feet in no time! 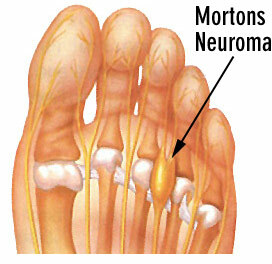 A Morton’s Neuroma does not generally get better on its own. There are several causative factors which could contribute to the severity of the condition and left untreated could be quite debilitating. Left untreated this could lead to further deterioration of the foot pain or create different pains in other parts of the body as the human body tries to find other ways to compensate and cope with the pain. The longer this condition is left untreated, the longer it could take to treat and the greater the pinch on your back pocket. In severe cases, surgery may be the only option to remove the swollen nerve. With the right treatment plan put in place by your experienced and passionate podiatrist it’s only a matter of time before your back on your feet doing the things you love doing. Whether if be participating in sporting events, going shopping or just spending some quality time with your children or grandchildren, which once may have been a burden! Avoid wearing high heeled shoes and ballet flats – wearing either of these shoes dramatically increases forefoot pressure loading which can cause continuous irritation to the neuroma thus not allowing it to settle or aggravating the nerve and causing symptoms to deteriorate. Wear spacious footwear which have a deep and wide toe box – wearing shoes with the right width and depth is crucial. Have a well fitted shoes reduces the possibility of a ‘squeeze’ effect on the forefoot which in turn reduces the friction pressure on the nerve allowing it to recover. Rest – a 2-3 week period of resting from high impact activities is important to allow the irritation upon the nerve to settle and ease your symptoms. Anti-inflammatory treatment – A Morton’s Neuroma is commonly associated with swelling and inflammation which can be painful. Anti-inflammatory therapy such as Voltaren can be useful. If any of this relates to you then you’ll be glad to learn that with further guidance form an experienced and passionate podiatrist there are further interventions that can be implemented to get you back on your feet as soon as possible. Orthotic therapy/offloading devices – Morton’s neuroma can be exacerbated by poor foot posture. Orthotics are arch supportive deviced used to support the arches and correct poor foot posture which could be causing the symptoms. Offloading pads can be used to evenly distribute pressures from high pressure ares to assist with recovery. Trigger point therapy techniques – this is using acupuncture needles in specific locations to reduce the pain and inflammation. If you are suffering from this type of pain, don’t hesitate to contact us now on 9542 3491, or you can book online, just click our ‘Book Now’ button at the top of this screen.